Thanks to Super Thunder and Brave Tomato for letting me use this guide! And… Yay! For being so nice and helping him, you get to go on the train with him! All aboard! Oh no! The wheel isn’t working! He’ll give you a telegram message. Now go left, to meet more people. S.B. Anthony will give you a pamphlet… And be sure to meet EVERYONE. Several other people will give you things, like newspapers. And so… You’re on the case. Talk to the reporter. Apparently Twain had a secret compartment. Go ask more people around. And to get to talk everyone, what I did was start from the right, all the way, and work my way to the back of the train. Start this again every tim someone gives you a new clue. S.B. Anthony said that Tesla has been locked in his cabin the whole time. So go right, and start asking again. Now, Gustave Eiffel said that he heard a cabin door open and close when the train went into the tunnel. Was it Tesla’s? And when you go to Mark Twain. he gets… Quite suspicious when you mention the secret compartment. h, it turns out it was the manuscript. Oops. But then, suddenly, the train stops. And sure enough, when you go check, the floor is covered with prune juice! After discovering the prune juice, walk a little right, to get a Pencil. And now, you go right and start the questioning all over again. Not much information is relieved, except Edison said the prune trail seems to lead to the Dining Car. Le Monde Reporter (whom I call Frenchy) says a similar thing. And finally, when you talk to the Porter, she (in my case. The porter is supposed to look just like you) throws the order sheet away, saying that orders are confidential. So open up the notebook, and using the pencil, check for an imprint. Apparently, Tesla ordered the prune juice. But he won’t talk to you. So go take a look at his luggage. There are coal smudges on his trunk, and when you lean down, you get attacked by a pair of scissors. If they really wanted to gt rid of you, they would have attacked with something more, uh, powerful. 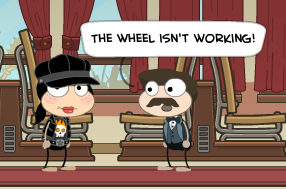 But this is Poptropica! Anyway, you get the scissors, and now you start asking again. But for now, skip asking everyone. Just go straight to the Porter. And the Porter confirms that, yes, the Coal Man did get something to drink. Now go to the luggage cart, and Frenchy will be right there. Talk to her. 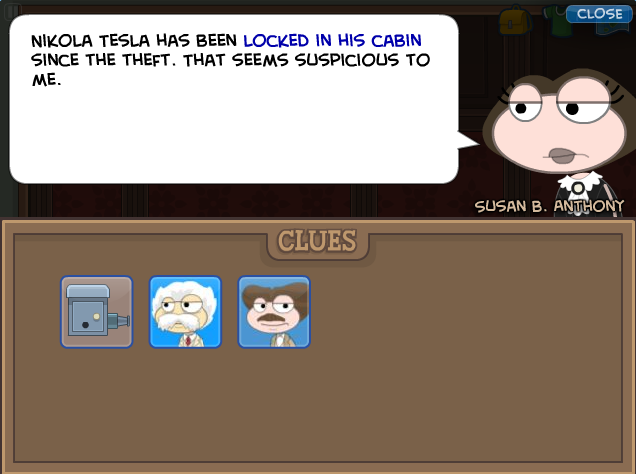 She says the key might be in his cabin, the key to Tesla’s trunk. But you can’t get in, so she tells you to go dress up as the Porter. So, go to the Porter closet, and get the Porter uniform. Now go to Tesla’s room. The underlined box is where the key is. But first, you have to click everything else. And then, when Tesla comes back, you can leave. Go to his trunk, and use the key. The device is in there! Frenchy will call the guards, and Tesla gets dragged away… and you go tell Edison. But.. oh no! He plays it, and Tesla was on the other side of the train when this thievery happened! You’ve caught the wrong person! Tis is Part 2, written by Brave Tomato. Due to a same costume deal with ST, this walkthrough contains me WITHOUT my star! You have to go talk to Telsa. But you can’t go through the car because a guard is blocking the way. Instead, you have to go ON TOP of the train! But how? Ok, go to the luggage car and climb up the luggage where you’ll see a go up sign. Go up. Now you’re on the top of the train. Duck whenever the redness on the right side of the screen is more up, when a tunnel is passing by. And jump when a sack or whatever it is passes by. Go to the right until you see a hatch. That’s the room Telsa is in. Enter. It’s the coal room, and Telsa is all chained up and stuff. Talk to him for a while. He’ll say that he had left behind something important in his cabin. And then he’ll ask for something to write with. Click use on the pencil, and he’ll draw a picture of the cabin like it was before he got captured. Exit the coal room to the right. The guard will ask what you did, and you lied saying that nothing was up. Go to Telsa’s cabin and notice that the briefcase by Telsa’s bed is open. Click on Telsa’s sketch and once the screen opens up, click use. Click on the pen and finally click on the briefcase to make a circle around it. Go back to Telsa the way you did before. Talk to him, telling him that the briefcase is open and all. He’ll start to worry, because something important is inside. And he has no idea how the case was unlocked. Moving on… exit the coal room and go into “Erik Weisz’s” room. Ask about the briefcase, and he’ll start acting weird. Go to the NY times reporter (he’s near Mark Twain’s room BTW) and ask about Weisz’s odd behavior and he’ll show you an article with a guy who looks familiar. Erik Weisz = Harry Houdini! Go back into Houdini’s room and move to the right to the right to pick up a set of lock picks. You’ll confront Weisz for being Houdini and he’ll escape through the hatch in his room. Follow him! Which means… more top of the train traveling. Making sure to avoid the obstacles, go to the left until you see an opening on the red cart. ONce you land on that cart, you’ll automatically go through the cart into the junk room. You’ll hear a “blub blub” coming from inside those weird curtains. Use the scissors to reveal Houdini trapped in a water tank. But this is no trick: He can’t get out! Now, you need to pick those locks, fast. Line up the things using the appropriate shaped pick and line up the line to where the color of the lock thing changes. The first one is easy because the locks are in order, but the others are all mixed up. My hint: take your time while still going quick. Once you get Houdini out of there, you’ll accuse Houdini of being a theif. However, he’ll reveal that he’s trying to solve the mystery as well as you are. Ok, now go to the left until you reach the Pinkerton car. You have to be swift to avoid the traps. Jump up the boxes and jump over the first gap and fall down the second gap. Move quickly to the left and exit the pinkerton car. You’ll end up in the last boxcar where ANOTHER famous passenger is. And who is it? Grover Cleveland… that guy who became president twice, right? Say the second dialogue thing… and Cleveland will explain everything. When he does the … thing, here’s the order in which to click the pictures: prune juice, coal marks, luggage key, breifcase, transformer. So it’s either “Frenchy” or Gustav Eiffel. Talk to Eiffel, and he says that he’s French but there’s a lady’s hankerchief in there, so it’s… *dun dun dunnn* “Frenchy”. After the talk, you will arrive at the fair. Now to get off and stop her from destroying the transformer. So… she’s only doing this for her country’s reputation? She will run off and you got to go after her. Once you reach the first area, you’ll see her cry to the guards and do a pity cry emote to go after you. WHAT A DRAMA QUEEN! The guards will chase after you now. Quickly go up to the podiums and wait for the first lion to be fed. One it’s chewing, jump on its nose. Do the same with the rest of them. You’ll land on a platform. Quickly jump onto the bouncy window things and avoid the flaming and sharp things. There are 4 you have to avoid. You’ll see a sleeping Poptropican using a snake flute or whatever it’s called. Go up the cap and go left. You’ll accidentally interupt a dancing show, and you’ll experience one of the many Poptropica firsts… The girls twirl! Once you get on the ledge, you’ll see Frenchy at it again… with her pity cry to the guards, and she’ll use the laughing emote afterwords. Get on the totem poles. Jump from totem pole to totem pole, trying not to fall to the ground. ONce you get to the 4th one, the guards will shake one of the totem poles and knock them over like a domino effect. Go left. Now. You’ll see her jump up the ferris wheel. Follow her by climbing ropes and jumping up platforms. And it’s raining. Great. Umbrella anyone? Anyone? No? Just get back on topic? 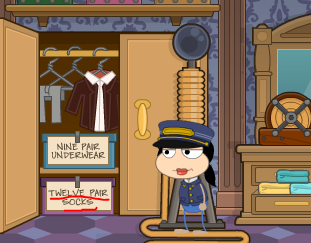 We don’t care for these Poptropica firsts? Ok.
Once you get up to platform #13, Frenchy will push a crate to push your platform down a notch. Jump up the roof of the platform… and swing a rope thing across. 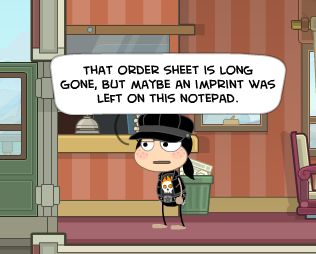 Yet ANOTHER Poptropican first. You’ll land on the other side. Climb up more ropes and jump on more ferris wheel cars. ONce you reach the roof of a damaged cart, Frenchy will throw the transformer. Quickly jump on the rope and swing. You’ll grab the transformer and land on the other side once again. Jump up more carts and corner Frenchy. She’ll be startled by a lightning flash and fall… into a water tank? Talk to George Ferris and give him the transformer. Then finally, talk to Grover Cleveland and he’ll give you the island medallion. Congrats! You’ve completed Mystery Train Island! Thank you, Super Thunder, for collaborating with me in this walkthrough.